One of the most exciting periods in local automotive history was assuredly the turn of the last century when Middleborough began to transition towards automobiles, first as a means of recreation and later as a method of transportation. 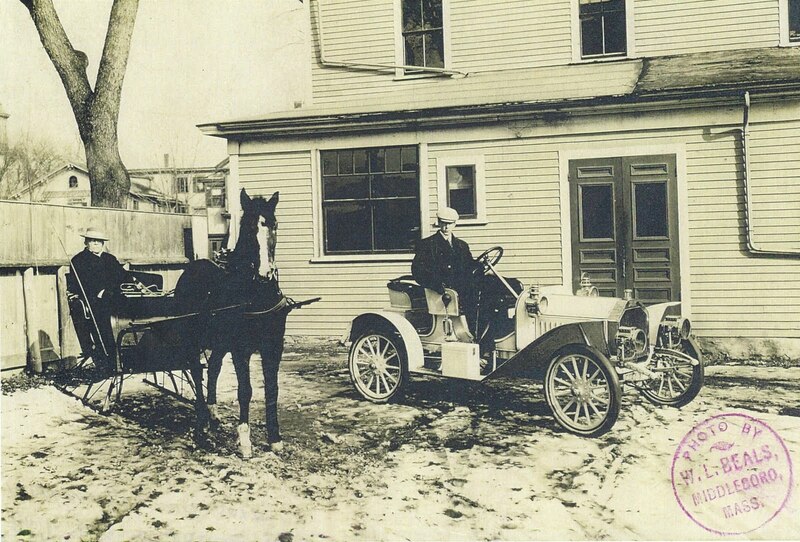 In the early 1900s, Middleborough residents took avidly to the automobile. By 1906, it was reported that Middleborough had the highest rate of ownership in the state, and local owners and enthusiasts helped popularize automobiling. Among these owners was Allan R. Thatcher who in the summer of 1908 purchased a Buick runabout. The transition from horse and carriage to "horseless carriage" was not always without challenge. In Booth Tarkington's The Magnificent Ambersons, the spoiled George Minafer says of horseless carriages: "Those things are never going to amount to anything. People aren't going to spend their lives lying on their backs in the road and letting grease drip in their faces. Horseless carriages are pretty much a failure..." Many traditionalists shared the same view and retained their horse and carriage in contrast to the new automobiles which were notorious for their frequent breakdowns. With the correction of the deficiencies of these early automobiles, however, automobile manufacturers, including Buick, were able to build vehicles which were seen to be reliable, practical ad desirable. Pictured above is the juxtaposition of old and new. Henry L. Thatcher (1850-1930), founder of H. L. Thatcher & Company, printers, sits in his sleigh which has been taken out of storage for the onset of winter. Thatcher's son, Allan R. (1877-1948), is seated at the wheel of his three-passenger 1908 Buick Model 10 Touring Runabout. Promoted at the time as the Gentleman's Light Four-Cylinder Roadster and advertised as a "high powered, high grade runabout", the car was produced by the Buick Motor Car Company in Flint, Michigan. (The right headlamp obscures the distinctive Buick logo on the grill). The 1908 Model 10 was Buick's most popular model that year with just over 4,000 being produced. Helping drive the popularity of the vehicle was the fact that it was featured in a number of automobile races of the period and consequently had a sporty image among the motoring public. The four cylinder engine produce 22.5 h. p. Featuring acetylene headlamps and oil sidelamps and tail lights, the model 10 sold for $900 and was the least expensive model in the Buick line. Its color was an off-white known at the time as "Buick gray". For inclement weather, an optional windscreen and top was available. (Note the placement of the steering wheel on the right side of the car). Despite its popularity, the vehicle which was introduced at the New York Automobile Show in November, 1907 it had a production run of only three years being produced through 1910. Thatcher, too, may have become disenchanted with his car. He sold it in the spring of 1909 to Brockton parties. The scene of the photograph is the rear of the Thatcher Block on Center Street. Just behind the close board fence at the left is Thatcher's Row. The building in the left background with the arched window in the gable peak is the T. W. Pierce hardware store on Center Street, the site of which is now occupied by Benny's. At the extreme left, a portion of the former steeple of the Central Methodist Church on School Street may be glimpsed.